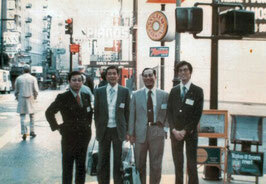 The place was in Community Center next to Cultural Hall. This picture was taken in the morning on April 26th. 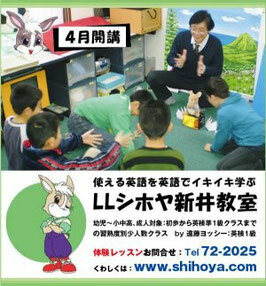 ホームページ内のブログ：www.shihoya.com は、近々、ブログ専用サイトの http://mpec.blog.fc2.com/ に移行いたします。後者に慣れるまで、両方に掲載中です。The blog-site of Homepage is going to be moved to a dedicated blog-site in a near future. 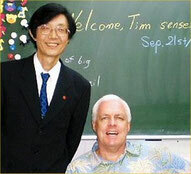 This blog is available to be seen on both sites until Yoshy gets used to the latter one. 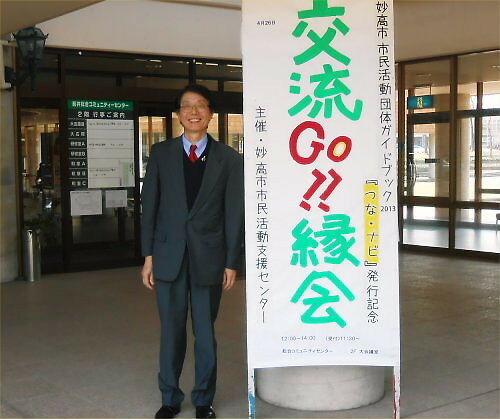 On Saturday, April 26th, from noon, Yoshy joined the first “Go!! 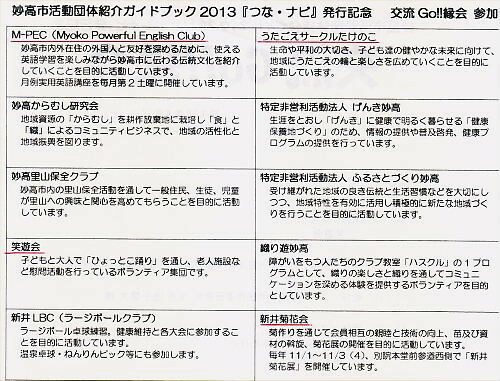 Enkai” under the *auspices by “Myoko Citizen Activities Improvement Association” *on behalf of Myoko Powerful English Club (M-PEC). 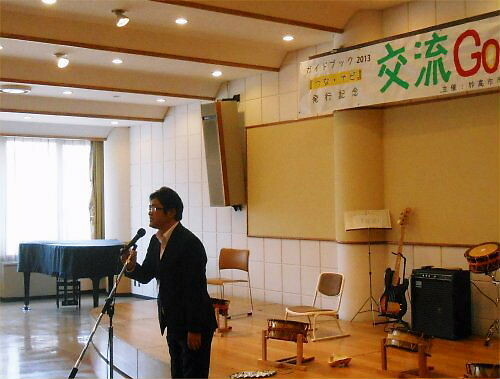 It was an exchanging party for *commemoration of publication of “Tsuna-Nabi” in 2013. 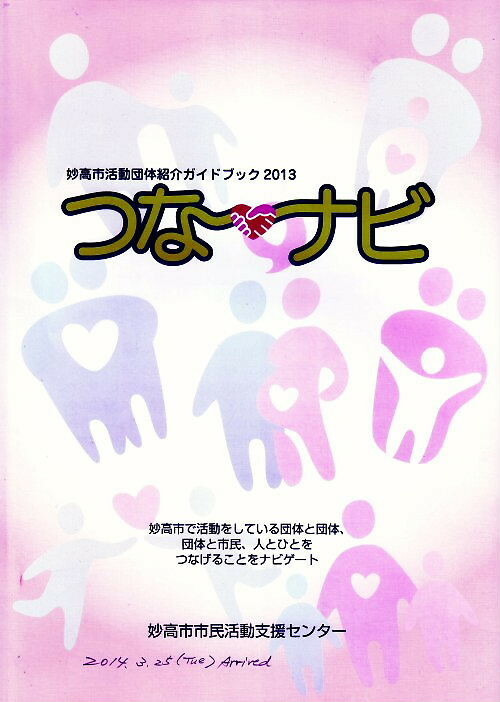 “Tsuna-Nabi” is also a coined word, which means to “*navigate bringing encounter with active groups in Myoko City, the groups and citizens and the *individuals”. 33 representatives gathered there from all of 102 groups. 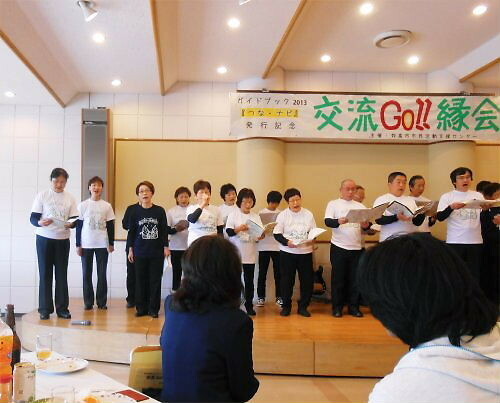 In order to *warm up the *buffet party, “Sho-Yu Party”, which means having the audience smile and enjoy their original games, etc, “the circle of singing songs” and so on. 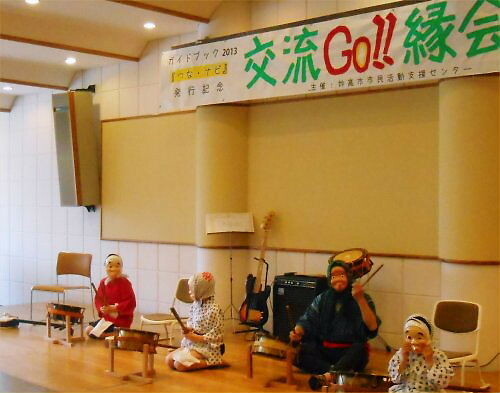 There were many kinds of groups, too including cultural ones like “Chiiki-nokoshi Kyoryoku-tai”: “Party for Helping Rural-area Survive”, “Myoko Powerful English Club (M-PEC)”, etc. The atmosphere was alive with all sorts of flowers. 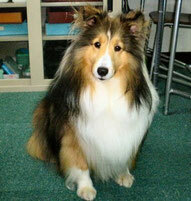 Yoshy was given enthusiasm and guts from each group I exchanged business cards with. I was able to have a good time to chat with 70 ladies and gentlemen of all ages whom I met after so long. 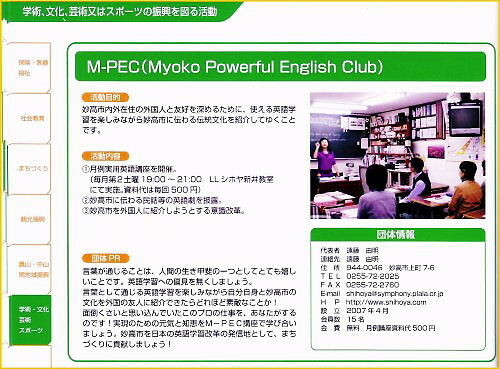 Though “20 business cards of M-PEC” with me were not enough to use, it was lucky for me because M-PEC was printed at the top place of the program of that party. 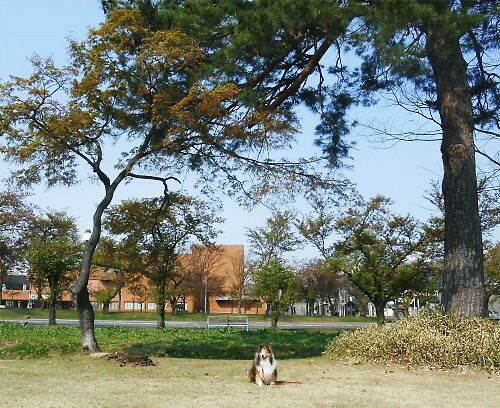 I couldn’t help leaving there in the middle at 2:00, since one lesson of LL Shihoya Arai School was waiting for me. After that, R and I worked in LL Garden until dark. 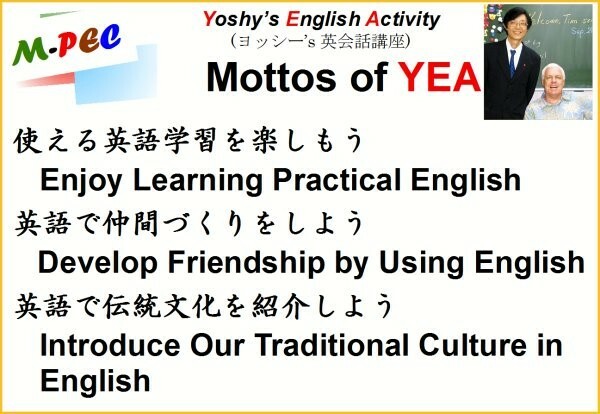 次回の講座は、5月10日(土)です。YEA (Yoshy’s English Activity) is waiting for anyone who is J/S High School students and adults on the 2nd Saturday every month, from 7:00 to 9:00 pm at LL Shihoya Arai School Next lesson is May 10th (Sat). 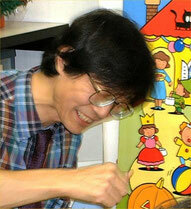 Yoshy asks those who will attend YEA to call me, 0255-72-2025 by May 8th (Thu).